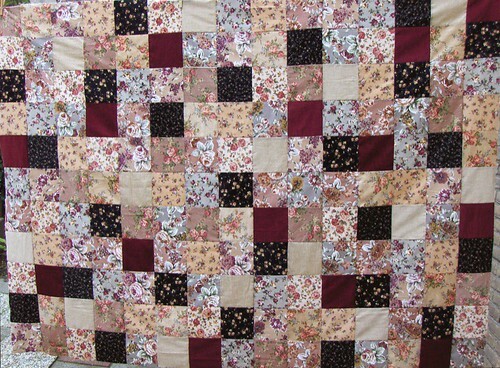 baby rib quilt, originally uploaded by Monkicat. That wasn't the intention. When I first purchased the fabric, I thought it would be a quick and easy project, just zoom the squares under the machine, some fluffy batting and soft flanel backing and voila! a soft and cozy quilt for chilly winter evenings on the couch. No such luck. A wise and dear friend told me once while I was learning to spin to let the wool speak, and allow it to do want it wanted to do. Fabrics speak too, at least to me, and this quilt told me it wasn't finished. So now I've gone into my sewing box, and found a collection of beads that had mission now long forgotten. The closet is getting a once-over as well, and it's actually fun digging through my stuff and finding small treasures, some for this project, and others not having to do with it at all! I like what you have done so far and I can't wait to see the embroidery. Now, will you bead and embroider the same square or will you alternate (embroider some squares, bead others)? To follow the advice of your "wise and dear friend", let the squares speak to you. Some may whisper "embroider me", some may want more bling with beads and others may really want to show off and demand both. This quilt may take you a while to complete.